Questrade has the lowest commission cost and fees in Canada, calculated at $0.01 per share with $4.95 minimum charge ($9.95 maximum cost). Questrade has no charge on ETFs, no annual fees, fast customer service often, much touted tools, many trading platforms, and 20 years experience. Questrade is Canada’s largest and most popular online brokerage company as of April 2019. They were founded in 1999 and offer a full range of investing / trading products and services for both the average investor and high-volume active trader. Their journey from industry laughing-stock in its early years to its current place atop the field, consistently, as the best brokerage firm in Canada (cited by Globe and Mail, MoneySense Magazine, and Deloitte annual rankings) has been a long and fascinating one. Within this in-depth Questrade review I will explore their impressive range of offerings and debate if you should join. Use Offer Code: Canada to get $50 free from Questrade. How much does Questrade cost? Where can I get the Questrade offer code? Can I lower the foreign withholding tax rate? How do I fill out the W8BEN form? How do I get trading reports before 2011? What is the interest rate when buying on margin? How do I register for a DRIP? Do their platforms support Mac/Linux? What is the best way to convert CAD/USD? How do I stop paper-mailed investor documents? How do I avoid mutual fund trailer fees? The above table should be glanced at again! It is not a typo, nor an exaggeration! Questrade offers the cheapest trades in virtually every investment category in all of Canada. There pricing structure hasn’t changed since their inception and is so impressive that it actually encourages new and small investors to jump into the investment game while also drawing in disgruntled investors from other brokerages. Questrade conveniently can cover all transfer out fees imposed by other financial institutions if interested in moving your existing trading account to them. This makes the allure to join even more tantalizing. For stock trading, Questrade offers a unique democratic pricing structure. Long-term, less active, investors have the popular option of 1¢ per share with a minimum charge of $4.95/trade and a ceiling maximum commission charge of $9.95. Active traders — those who make high volume share trades — have the choice of 1¢ per share (1¢ minimum / $6.95 maximum), or a $4.95 flat stock commission charge. All account holders can switch between these pricing options at any time. But be aware that a switch to the active trader program involves subscribing to one of Questrade’s several advanced market data plans. Since 2013 Questrade continues to have no commission charge on the purchase of ETFs (Exchange Traded Funds). ETFs are free for everyone. This has radically changed the face of index investing for the better. It has opened up a whole new world for those who prefer to purchase on a monthly basis to take advantage of dollar-cost averaging. It also makes compound interest and re-balancing portfolios that much sweeter. While we’re on the topic of ETFs, many other brokerages (including banks) still charge a fee for ETF trades, strangely enough, ensuring the ill-advised “timing the market” strategy as a common practice by many amateur investors at these other financial outlets in hopes of saving on commission costs. This is obviously no longer necessary while investing at Questrade. With so many turning to ETFs these days due to their low MER and diversified reach it’s a wonderful breath of fresh air to be able to do so at no cost. All indications seem to be that Questrade was the first discount broker in Canada to do this, and I applaud them. Questrade also makes it abundantly clear that they don’t charge setup fees, annual fees, and hidden fees on any of their services which is a welcome change from the industry norm. A special note should be given, however, to how they handle account inactivity. Historically Questrade has never charged an inactivity fee, however, they recently did a subtle change to that policy. It’s actually not that bad when you peruse the details. If anything it’s quite reasonable. This policy adjustment can potentially charge $24.95 (no tax) per calendar quarter. All Questrade account holders, however, including households having the same physical address (which can also be a group of strangers when using the myFamily program), with combined equity assets of at least $5,000 are exempt from this inactivity fee. This fee also does not apply to charitable accounts, forex accounts, individuals 25 years of age or younger, and all new accounts opened for only 6-months. If, however, this fee still does apply to you then simply make at least one commissionable trade per quarter (once every 3-months) and you will not get charged. Further, if you are inactive for a quarter and do get charged, then by making at least one trade in the following quarter will trigger a refund up to $24.95 in commission-free trades as compensation. Fair enough. For most investors this policy change is trivial since their assets are almost always over $5,000. And so most people will never get charged this inactivity fee. As I pointed out earlier, I think this change is perfectly reasonable and still miles better than all other discount brokerage houses who not only charge an inactivity fee, with no exceptions, they do so more frequently (each month) and tack on countless hidden fees which Questrade does not. There are two sets of accounts offered by Questrade: Self-directed and online Managed Investing. Self-Directed Investing: These accounts are for those who want full control of their investment decision-making. They will save you the most money, in terms of commission costs. The Standard Margin (Individual) account is the most popular account type opened by new customers. Managed Investing: These accounts are for those who want Questrade to manage all investment decisions on your behalf, for a nominal annual fee. They require the least amount of effort on your part and tend to earn higher returns in the long-term. From my analysis, these accounts are indeed handled by a real staff (the Questrade Wealth Management division) behind the scenes. Under their management, they consider your personal goals and risk tolerance to match, manage, monitor, and adjust for the best investments without your daily involvement. Questrade calls this Questwealth Portfolios. Please note, unlike self-directed, managed investing has an annual fee. In my opinion self-directed is all one will ever need considering how making informed investment decisions is quite simple for even newcomers these days. And to compound on this, self-directed accounts have no fees (outside the usual trade commission) associated with them unlike their managed investing cousins. I’ll be going in-depth on their managed investing side in a later section of this review. Although immediate access is gained after joining (don’t forget to use the Questrade offer code: Canada to get $50 free during sign-up), your account isn’t activated. To officially activate your account, so as to begin trading, an initial deposit is required. For stocks and options, you will need to maintain a minimum equity balance of $250, after meeting the initial deposit requirement, to keep your active account in good standing. If, however, you plan on doing managed investing then it’s required that you maintain $1,500 in account value once you’ve invested. If that value drops below $1,500 then your investments will be liquidated. Once this initial minimum deposit has cleared, Questrade emails you a confirmation message. For offline applications you will be contacted by one of their representatives confirming trading can begin. It takes roughly 1-3 business days for Questrade to receive and process this deposit. * Canadian currency deposits into forex & CFD accounts are auto-converted into US currency. Opening an account with Questrade is a remarkably quick, intuitive, and painless process. It took me no more than two minutes to open a general (non-trading) account, which immediately gave me access to practice within their trading platforms. In under twenty minutes I was able to open their popular individual margin trading account. The online application asks for your social insurance number (SIN) for reporting interest and dividends earned to CRA (you are given the option to refuse their request), employment information (or source of income if unemployed), and a form of identification (e.g., driver’s license). And although they have an offline alternative that you can printout and fill in, I highly recommend their secure online process instead because it reduces the amount of write-in errors and legibility issues, and supports DocuSign for the online signature signing process. One of the first things you are required to do when signing up is to define a user ID and password for your new account. Doing so provides the incredibly convenient ability to return to an incomplete application at a later time. I found that sessions during sign-up time-out after 30 minutes of inactivity. This is more than enough time to collect required documents and credentials, and to review your inputted details for any mistakes. Accounts numbers consist of ten numerical digits (e.g., 12345678-90). This is a step up from their pre-2011 six character alphanumeric size, and as such it’s been reported that some external banks still enforce an eight character limit for payee accounts when you attempt to send money to Questrade. To get around this our readers have indicated that you only need to provide the first eight digits of your Questrade account number. Using this helpful workaround your funds will still be delivered successfully. When making a deposit using online banking or via Interac you should keep in mind that it’s not possible to send USD to your Questrade account — only CAD. This is due to a limitation of EFT at the issuing bank, not Questrade. All the other funding methods shown above support the ability to fund your account with either CAD or USD. Withdrawals of USD funds from your Questrade account to a USD bank account works perfectly fine. If you need to deposit USD currency right away and none of the methods above fit your needs, you still have few more options: You can convert your existing CAD balance, held within your Questrade account, to USD using the Exchange Funds tool (found under Requests). This can take up to 24 hours to process. Or, you can take advantage of Norbert’s Gambit (see the FAQ)! Successful conversions have been confirmed by readers of this Questrade review. Before withdrawals can be initiated, Questrade requires that you provide a void cheque or a pre-authorized deposit agreement form signed and stamped by your bank. This only needs to be done once per bank account. It takes roughly three business days to process a withdrawal and for the funds to arrive into your bank account. Your account’s primary control portal is known as myQuestrade (alternatively, Questrade Account) and it is a beautiful experience with well thought out organization and visual appeal. There is a lot of love put into this portal, providing a consistent fully immersive and responsive experience. I found that it worked seamlessly with every smartphone, tablet, laptop, and desktop I could throw at it. This portal fully integrates trading and account management together effortlessly. It gives immediate access to buying and selling securities, working with research tools, using a bustling library of partner apps (and developer’s API) on any of your devices, viewing your account activity, analyzing balances and positions, managing your personal details, viewing statements, making fund transfers in & out of your accounts, uploading & downloading your documents, exchanging CAD/USD currency between accounts, taking corporate action on shareholder communications, transferring positions, opening additional accounts, retrieving tax slips, exercising options, interacting with mutual funds, and more. Several self-help areas, including a robust learning centre of ebooks (e.g., options strategies, and Forex & CFD trading), fact sheets, and an in-depth financial glossary were always conveniently near by for easy access. Once your account is activated for trading, during your first log in, you are asked to select a default home base. A home base is where you would like Questrade to directly place you each time you sign on. You have a choice of either your account management page or the online trading platform. This is definitely a helpful time saver, but, if necessary, you can jump between each via an always-visible top menu bar. And you can change your home base at any time from the Settings page. Located under the Reports menu option are a slew of subcategories providing details about trading and general account activity. Some of these subcategories include: Investment Summary (pictured above), Trade Confirmations, Account Activity, Statements, Investment Return, and Tax Slips. Collectively, these reports allow you to explore all of your investments (stocks, funds, bonds, etc), buying power, total equity, current cash balances and positions (in CAD and USD), and more. Your trading history is maintained for 36 months while eStatements, generated monthly, are stored for 7 years. Tax slips (e.g., T3, T5, T5008) are also made available electronically for each year. New statements are published on the 15th of each month and made available for immediate download as PDF files. These reports have improved dramatically over the years and contain a rich tapestry of useful colourful charts and graphs to make it easier to understand your performance to-date and compare it against previous years. Going further, these statements are very detailed, and very carefully constructed not to just be intuitively understood by the layman investor, but goes in-depth to provide breakdowns of the month’s activity details, a summary of all trades settled by the end of that month, conversion rates, allocations, current and historical rates of return, dividend distributions, and special notes from the brokerage. Because I view myself as an average investor, the styling approach laid out in these statements are an excellent bonus offered by Questrade. Although Questrade highly endorses the viewing, downloading, and/or printing of monthly statements online as PDF files, and provides them free of charge, they still offer the alternative option of mailing out paper statements. This alternative, however, does cost $20 per statement. If you still prefer these hardcopies, then you can put in a request directly by phone or through their live help chat window. Questrade’s margin and registered accounts are comprised of two sub-accounts — one that holds Canadian funds, and the other for holding U.S. funds. This is incredibly convenient since it stops unnecessary automatic conversion charges, common at virtually all other brokerage firms, when trading U.S. instruments. Questrade does not do automatic currency conversions. Other brokerages, on the other hand, do this simply because it maximizes their profits. Good for them, bad for you. Funds can be moved between sub-accounts using Questrade’s Exchange Funds feature, but just take careful note that by using this tool it will involve a conversion based on the spot rate at the close of market in Toronto plus a spread fee. This spread fee is 1.99% for both margin and registered accounts. If total equity exceeds $100K, however, this fee drops to 1.70% for margin and 1.00% for registered accounts. If converting between USD/CAD, a better approach would be to use the Norbert’s Gambit technique because it eliminates almost all currency exchange fees. Please see the FAQ for more details. An interesting related note is that Questrade continues to be the only brokerage in Canada to allow dual currency (CAD and USD) to be held concurrently inside registered accounts (i.e., TFSA, RRSP, RESP, RIF, LIRA, LIF) at no cost which in and of itself will save a colossal amount of money from unnecessary conversion fees. And whereas other brokerage houses do routinely charge annual fees for just having a registered account, Questrade doesn’t charge an annual fee at all; allowing your yearly contributions to grow with maximum efficiency. Questrade has four trading platforms: Questrade Trading, a fully functional web-based trading platform for Windows/Macs/Linux desktop users, as well as for mobile devices; Questrade IQ Edge, a streamlined desktop-based trading platform for Windows 7/8.1/10+ and macOS 10+; Questrade app, their mobile entrant into the field of on-the-go trading, for iOS and Android; and Questrade FX Global, their forex & CFD market trading platform for desktop and mobile users. This entire suite is free to use and practice accounts (with virtual money) are available without even having to activate a real trading account. Many of these platforms include snap quote live Canadian/U.S. streaming level 1 data, a charting package, research tools for fundamental and technical analysis, and more. And although it is made available for free, these platforms can be upgraded to include one of three data packages or add à la carte feeds. Now, let’s probe deeper into each of these unique platforms in turn and see what they have to offer. This is Questrade’s most popular free trading platform. It serves as the primary trading gateway for most users entire investing experience. It also serves as Questrade’s answer for those who, for one reason or another, may not have access to (or be compatible with) their mobile or IQ Edge applications. As such, this trading platform is what Linux users turn to when needing to trade stocks, ETFs, and options. Questrade Trading is craftily integrated into the Questrade Account portal and is reachable through the prominently displayed green Trade button located at the top menu bar. For convenience, this platform can be set as your home base when you log in. This platform is a fully compliant HTML5 browser-based responsive experience, it does not require a download, nor any third-party add-on, to be fully functional. Taking a spin with this platform was an incredibly liberating experience — an excellent amalgamation of power and usability. It’s very featured-packed. It also introduces the concept of Gadgets into the platform lexicon. A gadget is an arrangeable user-customized view into your trading/market details. Some of these gadgets include: activity (a logs viewer), balances, time & sales (current global activity of a stock), level 1 quotes, level 2 quotes (if you’d paid for this extension), news, orders, charts, position summary, and a watch list. Any custom changes you make to your platform layout are automatically saved and restored when you re-log back in. This platform was surprisingly lightning fast and responsive in every web browser I tested it in. Memory and CPU footprint usage was astonishingly small despite the depth of options, activity, and functionality it had to offer. I also found that sessions don’t appear to have any inactivity time limit. A nice bonus feature of this platform was being able to start a trading task on one device (e.g., a home PC) and effortlessly shift to another device (e.g., smartphone or tablet) to complete it. This is an invaluable little addition because it can allow one to carefully construct lengthy trading procedures while permitting free movement during busy schedules. Additional bonus points also have to go to their clever use of green and red colouring in real-time to help more easily distinguish stocks and options price variations as they happen. Impressively, this web-based trading platform has almost all the features found in IQ Edge, its bigger brother in this family. Notable differences include the lack of multiple workspaces, heat maps, and surprisingly, the inability to change color themes — you’re stuck with that white look, unlike IQ Edge which has selectable themes. So, if you feel you may need one or more of these missing features then I’d recommend you use their desktop-based IQ Edge platform instead. Because many of us spend a lot of our time on mobile devices, it only makes sense that we want to be able to swipe, tap, and invest on-the-go as well. Questrade app fills that void. This free platform is a surprisingly very powerful, very capable mobile trading platform. Operating anywhere at any time, this app is available for iOS and Android devices from their respective app stores. The visual layout and organization of features is very well thought out — I can navigate and use the app with intuitive ease. And although they conveniently provide an interactive help tool I found there was little need to use it. Questrade had originally planned to release a similar version for Windows Phone and Blackberry but, understandably, due to those aforementioned device’s almost non-existent market share, the idea was scrapped late in the development cycle. As such, users with those devices, including Linux, will need to use the browser-based alternative trading platform: Questrade Trading. I found Questrade app’s feature set to be nearly identical to their Questrade Trading platform, but with visual tweaks to better suit portable device operability. You can even perform account management actions directly within the app. After using this platform for several days it’s clear to me Questrade is continuing to aim this mobile app to be as feature-rich as IQ Edge over time so that even active traders can be less dependent of their desktops. I’m sure this will be greeted with overjoyed smiles by those traders who have been yearning to be more fully unshackled from their IQ Edge dungeons. On-the-go is here to stay so it only makes logical sense that Questrade will be continuing their trend of integrating more Edge-like whiz-bang functionality into this app, possibly surpassing their web-based sibling over time. There is no question that this mobile app is an integral component to Questrade and quite possibly view it as the most important in this entire platform suite, in terms of long-term growth, since most people will continue to be looking to their phones (and other portable devices) as their primary hub to the markets. This is their free specialty web-based and mobile (Android and iOS) platform geared specifically to foreign exchange (FX) and contract-for-difference (CFD) traders. For the curious, FX contracts and CFDs are over-the-counter derivatives. FX Global gives you the ability to speculate on the price movement of currencies, energy, agriculture, metals, and equity indices from one account. FX Global prefers to live and breathe within the web browser. And my tests found the interaction to be seamless across every device I checked. That includes: PC, Mac, Linux, and mobile devices. Their mobile FX Global app also ran smoothly in my tests, but I felt more at home using the web version. The platform conveniently tracks all trading activity in real time. I could execute trades from live bid/ask quotes just with a simple click or tap at any time. I was also able to keep tabs on open positions, watch for instant profits and losses, view account balances, and analyze historical activity, all on-screen. Other positive noteworthy features in my evaluation include the ability to switch environment themes (i.e., dark or light), up-to-the-minute embedded news, research tools, technical analysis indicators, watch lists, and push notification alerts to your phone. I found this platform to be designed very well and I could long and short hundreds of global currency pairs and CFDs with ease. The entire experience was surprisingly much more natural feeling than I was expecting; and this is coming from someone who has very little prior experience in the FX & CFD markets. Trading within the platform can be done 24 hours a day from Sunday evening to Friday afternoon, but, if necessary, existing forex account holders can also place orders for free over the phone. Questrade IQ Edge is the big boy of this suite. It comes as a free install-based native PC (or Mac) desktop application. And although it is commonly used by many investors, regardless of experience, this platform was specifically engineered to cater to active and professional traders. Interestingly, Questrade Trading and IQ Edge share many features in common. But I did find the following unique differences. IQ Edge allows for an unlimited amount of workspaces. A workspace is a screen area allowing one to open and customize a new set of gadgets or windows for a particular targeted purpose that suits a trading environment style. Multiple navigable workspaces is a valuable asset for active traders. Other key differences I uncovered was that IQ Edge offers significantly more advanced options for order entries, such as conditional orders (e.g., trigger orders at a specific time, price, or volume automatically), creation of bracket orders, more extensive alerts, and multiple order entry windows. This platform also includes more extensive research tools and heat maps. I also discovered a few subtle differences as well. IQ Edge allows for extensive gadget customizing, which takes them well beyond what is possible in Questrade Trading. Most of these customizable features, however, are visual (e.g., drag-drop, resize, custom colourizing, blinking text). It depends on the gadget. Curiously, gadgets don’t have a snap-to feature and so they do not auto-arrange when the main application window resizes. It’s a bit annoying but not a deal breaker because most people just position their gadgets at a particular spot and maintain the application window at a set size. Interestingly, any gadget customization you make in IQ Edge does not transfer over to their other trading platforms (assuming the same gadget exists), and vice versa. Ticker symbols and the related data inside gadgets (e.g., alerts), however, are properly maintained across different trading environments. Thankfully IQ Edge incorporates different user-selectable colour themes, ranging from dark (default), light, and a sky blue. This is a welcome change from the screen burn-in white theme that their other trading platforms (excluding FX Global) are unfortunately hardwired to only use. One additional allure of IQ Edge is that it gives a trader the sense of comfort knowing their platform’s trading activity will not be delayed or experience hiccups as might be the case if using a web browser. When speaking with Questrade’s technical staff, I was told that this platform is written from the ground up using optimized C++ code and deployed specifically for Intel processors, ensuring the speediest of responses for the most serious of traders. Unfortunately, at the time of this writing there is no 64-bit version for IQ Edge on PC platforms. For Macs it is natively 64-bit. Don’t get me wrong, this will still run perfectly fine on 64-bit Windows-based PC systems. It just won’t be running as efficiently as it could be. Here’s hoping in the near future an optimized 64-bit Windows version of IQ Edge will be made available. One of the keys to successful investing is through tenacious market research — doing your homework. And so, while compiling this review I felt an honourable nod should be given to Questrade’s stand-out research tools: Market Intelligence and Intraday Trader. When you login, both tools are found tucked away under the Market Research menu selection. Market Intelligence is the place to go when you need to get the latest market news in North America, Europe, and Asia as it happens. With research data and ratings provided by MorningStar, I was able to successfully look up a lot of valuable material (e.g., reports, earnings) on whole industries, companies, and specific stocks without having to leave my account. There is also a very useful criteria-based email alerter to keep track of stocks. You can set it up to alert you on price changes, volume fluctuations, bid sizes, and more. The other research tool, Intraday Trader, is a comprehensive technical analyzer that monitors the NSYE, NASDAQ, AMEX, TSX, TSX Venture, and ARCA. By providing an event triggering watch list (pre-set or custom), it’s able to scan those markets and cross-reference technical patterns of interest throughout the trading day. When a target has been triggered I get notified with charts and a description on what caused it and why. It’s clear that the goal of this tool is to give you a heads-up on potential trading opportunities as they are happening. Interestingly, I began noticing over the following days that I kept returning to use this tool and adding more refined complexity to my event triggers. In short, using this tool can become quite addictive. Self-directed investing (aka DIY trading) is offered essentially by every discount brokerage in Canada and has been a popular choice by the general public due to the cornucopias of easy-to-use tools and support made available to investors desiring complete control over every aspect of their financial interests. With this style of investing, customers have always been able to sculpt their own investment strategy, define their portfolio, buy and sell securities, and more. Another option exists, however. For those with very little time, while continuing to carry big investment ambitions, Questrade introduced Questwealth Portfolios, formerly branded as Portfolio IQ, the alternative to self-directed investing. Really known as managed investing, Questwealth Portfolios takes away the stress of investment decision making, such as asset allocation and re-balancing, and puts this work into the hands of experienced portfolio managers of their Questrade Wealth Management division. Who doesn’t want to take it easy and watch their money grow towards financial independence with little effort? It’s a dream come true! However, the difficulty lies in trying to figure out how exactly to do that. This is where I feel Questwealth Portfolios comes to the rescue. I discovered that Questwealth Portfolios was Canada’s first online wealth management service. Another accomplishment by Questrade. When speaking with one of their managers, he expressed that the advent of Questwealth Portfolios is to grow and become a definitive market disruptor. To make managed investing accessible to everyone. He went on to say that because managed investing has typically been an exclusive club for the very rich, their goal was to hark back to their motto of unlocking all things restrictive to the masses by doing away with convention. That’s a bold statement. So naturally I signed up for an account and had a look around. Opening a Questwealth Portfolios account is straight-forward and only requires an initial deposit of just $1. As an extra bonus, this review’s Questrade offer code — also known as a Questrade referral code — can be used when opening a managed account to receive a free cash bonus. Once open you’re taken through a quick, simple to use point-and-click/tap questionnaire (only ten questions in total) to set up an investor biography that identifies your risk tolerance, existing financial circumstances, market knowledge, and investment ambitions. This is all used to help crystallize the best portfolio that will matter to you. If your goals change, then you can adjust your biography to keep things in balance, which will then automatically update your underlying portfolio model accordingly. There are five portfolios and they all deal exclusively in ETFs. Composition is an assortment mix of sectors, markets, and countries. Further, each of these portfolios have three tiers. Each tier has a different set of sector-specific and country-specific ETFs. It is your account asset value that determines which tier position you’re automatically assigned within the portfolio you’ve selected. Interestingly, each of the aforementioned five portfolios are also available in SRI versions (Socially Responsible Investing). This means that you can alternatively get equivalently structured portfolios that invest only in companies that conform to stringent environmental, social, and governance (ESG) criteria. Fees associated with SRI managed portfolios are only marginally higher. For example, 0.20% for Conservative SRI portfolios, 0.28% for Balanced, and 0.35% for Aggressive SRI portfolios. Although it only requires $1 to open a Questwealth Portfolios account, your money sits uninvested until it reaches at least $1,000. Once that threshold has been reached, your money is automatically shifted into your selected portfolio, and your very own assigned team of specialists will begin actively managing and adjusting your portfolio as opportunities arise in the markets. I found they vigilantly kept re-balancing assets to stay within my risk tolerance without any daily involvement on my part, which was nice. Once invested, however, you will want to maintain a minimum balance of $750 to keep your account invested. I didn’t find any trading or trailing commission fees. I did uncover a nominal annual management fee, however, which varies based on your existing total account asset value. This fee only gets charged when you have at least $1,000 in savings within your managed account. If it does apply then it’s broken up and charged proportionally on a quarterly basis. Relative to other brokerages and banks, this management fee is by far the lowest I’ve seen. With the added benefit of taking full advantage of tax-loss harvesting, and providing a last quarter management fee refund guarantee if you’re not fully satisfied for any reason, Questwealth Portfolios is an extraordinary competitor in the managed investing arena. It has that perfect resonating mix all investors, big and small, crave when they daydream of an unshackled financial tomorrow. Participating in initial public offerings (IPO), secondary issues (additional shares/bonds offered by a public company), and structured products has always been the holy grail for many investors due to the incredible euphoric frenzy of the 1990’s internet IPO boom, and recently with the bitcoin cryptocurrency mania (via Initial Coin Offerings). Because IPOs usually tick up on first day closings, it makes total sense why so many want in — it’s a quick way to make an easy buck! However, due to the natural laws of supply and demand, interest in these new issues almost always outstrip the quantity made available, and therefore only insiders, well-connected bigwigs, and the very wealthy are usually the only ones who are granted access. Nepotism and cronyism at its undemocratic finest. For generations the general public has had little access to IPOs. There was a brief moment in time when Wit Capital, an internet startup of the 90s, briefly unlocked this secret world, but it was short-lived. Questrade became one of the new Canadian trailblazers to usher in a sledgehammer back into this world for the masses by introducing their IPO Centre. This centre is a very welcome sight and seems well positioned to grow into something incredibly special. The Questrade IPO Centre showcases newly available issues of Canadian equity, fixed income, and structured notes. For historic reasons, they also give access to a detailed back catalog of previous offerings. Each IPO’s respective fact sheet, investor summary, terms, preliminary and final prospectuses are also readily available. Although the IPO Centre mostly has Canadian offerings, U.S. IPOs do show up from time-to-time as well. Due to Canadian security regulations though, U.S. and other foreign-based companies must file their prospectuses in each province individually in order to be sold to residents of that particular province. Since many companies in the United States may feel that doing an IPO in Canada could be an added expense (e.g., listing fees, legal fees, French language requirements), and that domestic demand in the U.S. is already strong enough to satisfy the capital they’re seeking to raise, it’s only logical that most offerings you see listed in the centre are Canadian by nature. Fun fact: TSX has a very large mining focus. This is because many international mining/resource companies file a prospectus, raise money, and choose to be listed here in Canada. Registered accounts (e.g., RRSP, TFSA) are also eligible to hold the vast majority of IPOs and treasury offerings. Some IPOs, however, may not be eligible due to their company/offering structure and how widely held it is. My only complaint is that the number of IPOs to select from isn’t as bountiful as I would prefer it to be. I am not sure if this is due to the unseen battle that they surely must have with underwriters to be granted access to new filings, or if their staff is just being lethargic in pursuing more pickings. The IPO Centre is reachable on your desktop/laptop , smartphone, and tablet. When you see an IPO or other new issue you like, it’s a simple click/tap of the Buy button found next to that offering. Alternatively, you can call their trade desk to put in a request. All IPO and secondary offering purchases are commission free. Once your order has been placed, this is referred to as an “expression of interest”. An expression of interest makes Questrade aware you are putting in a commitment to buy a number of shares. This does not guarantee, though, that you will actually get any or all of the shares you’ve requested. When placing an expression of interest on their website, the trade desk contacts you to confirm the order within an hour. In rare cases I found it took up to 24 hours. There is a $5,000 minimum requested amount for submitting an IPO order. Some companies going public may even ask for an amount over and above this, but the majority of the time it won’t be above the $5,000 Questrade minimum. Once the order is confirmed, Questrade passes along your interest to the offering’s underwriter. For instant notification of newly announced IPOs and secondary issues, I recommend subscribing to their mailing list known as the IPO Bulletin. Surprisingly, I found that notifications arrived roughly thirty minutes sooner than the time it took for new issues to appear on the centre’s front page. That revelation can potentially lead to unique first access opportunities. Nice! Canceling a request can be made within two business days (this may vary depending on the province) of receiving, or deemed receipt of, a prospectus and any related amendments (found at the online centre). Processing time for orders can vary but usually it takes around three weeks from when the underwriters first launch the IPO and when the offering closes. Times can be shorter when dealing with some secondary offerings and preferred treasury shares. Once allocations from the underwriter are received, Questrade informs customers via email or phone. Allocations, however, may be distributed on a pro-rata basis if an IPO is oversubscribed (the number of shares requested by all interested parties is greater than what Questrade received), and so, as mentioned earlier, your original request amount may not necessarily materialize to what you actually get. For example, if Questrade receives a 50% allocation on their total order amount, they would then allocate only 50% to your original order request. Questrade has partnered with several financial service providers to help enhance your investment experience through third-party apps. Types of partner apps include trading platforms, stock pickers, performance recorders, statistics analyzers, portfolio monitors, etc. Once you grant permission to an app, it can access your account details (personal information is still kept private), retrieve market data, and assist you with placing trades through your Questrade brokerage account. Granting permission to a third-party app is as simple as finding an app of interest within the App Hub library, clicking the Add to My Apps button, generating a special (and necessary) authorization token, downloading the associating partner’s app (and/or signing up for an account via their website), and then inputing your generated authorization token within the app. The only apps authorized by Questrade are the ones listed in their library. If a third-party app is not listed there, then that specific app will not have access to your account. In other words, you cannot arbitrarily generate a generic authorization token for an unauthorized app. Interestingly, you can create and register your own app and become a partner with Questrade. I will discuss this in more detail under the Developer Platform section of this review. One strange quirk I did find, when you add a partner app it became difficult, if not impossible, to return to the App Hub library at a later time to add another app. Why Questrade didn’t add a navigable link back to the library on the My Apps page — if you’ve already added at least one app — is beyond me. Either this is an oversight, or a bug. I’ve reported this problem to them. Hopefully they fix it soon because the only way I could figure out how to return to the App Hub library was to remove all my apps. That’s very inconvenient. By the time you read this review it will probably already be fixed. Beyond that little issue it was really fun and quite advantageous to have access to so many third-party apps. Developers interested in writing their own applications or using tools from other third-party vendors can rejoice because Questrade has their own application programming interface (API). It’s free to use and can execute, modify, and cancel stock & option orders on Canadian and U.S. exchanges; retrieve balances, and positions as far back as sixteen months; and fetch delayed and real-time market data. Their SDK with sample code is available for download in C++ and C#/Active X. After a quick glance over Questrade’s very clean online API operations documentation, within ten minutes I had created my first, fully functional application in Microsoft Visual Studio C#. It’s very easy to make an app! I also love how they give access to a practice server for testing applications on. And once I had fixed all my bugs, I then was able to switch over to the live server. Very smart! Questrade implements Representational State Transfer (REST) for reading and writing data, and the OAuth 2.0 authorization framework for their security protocol. Everything communicates through HTTPS only. The great thing about using REST and OAuth is that development time is significantly reduced, as was evident by the time it took for me to make my first app, because they are widely used, simple to understand, standards for a lot of online development. I noticed there is an option to partner with Questrade so that your application can extend beyond your app’s library, and be made available to every Questrade customer. I did not test this feature because my application was just a simple proof-of-concept for this review, but I did speak with a technician who told me that there is no cost when partnering. Your application goes through a thorough quality assurance review, and if they feel your app will enhance their customers’ experiences, they will happily add it into the App Hub. Please note, though, if you develop a trading platform where your users make trades within your app on the live server, then your users will still get charged the same commission fees that they would have paid if they were using one of Questrade’s standard trading platforms. Questrade’s security measures have improved dramatically over the years. They use an impressive 256-bit SSL class 3 extended validation (with 2048-bit digital certificates) for both logging in and trading. Extra security during the login process can be provided by enabling two-step authentication. For those unfamiliar, two-step authentication is an additional security layer which requires not just a username and password, but you must also use another device that you currently have in your possession — typically a phone — to input a special code shown on that device during the login process. Questrade has an online security guarantee which insures investors against unauthorized transactions which result in a direct loss. This security guarantee, however, doesn’t extend to intruders breaching accounts on your end (i.e., browser vulnerability, PC/Mac infection). In other words, Questrade will indemnify you for the full monetary loss as a result of a direct unauthorized transaction and/or due to their own negligence. For this guarantee to process smoothly, however, I recommend you enable two-factor authentication prior to the unauthorized transaction. They are a CIPF (Canadian Investor Protection Fund) member, and so all Canadian investors are covered up to $1,000,000. They are also members of the IIROC (Investment Industry Regulatory Organization of Canada). For claims that exceed $1,000,000, Questrade offers extended private insurance up to $10 million. You will need to contact them directly by phone for more details in getting this extension set up correctly. Other noteworthy security features: Receive notification emails for new logins (disabled by default); and when joining, you must provide at least two security questions and answers — one of which gets asked when you attempt to log into your account from an unrecognized device. Each time you sign into your account your last login information is prominently displayed at the top-right corner with the date, time, device used, browser user agent, and the operating system of who last accessed your account. And lastly, a special appreciation goes out to the ability to set up a personal identification number (PIN) from your customer profile page. This PIN is optional, but is used to make it quicker to identify you when phoning in. You still have to provide other information about yourself when speaking to a representative, but the verification process is much quicker. I found this very handy, especially because I had to call in several times to better review their customer service. Customer services are the make or break for practically every company, irrespective of the industry they’re in. If customers have an issue, be it executing a hanging order, a problem with account management, or just to get in touch to have someone walk them through a task, it’s critical that customer service be attentive, knowledgeable, and understanding. You can have all the best technology and intuitive user experience in place, but if you lack basic customer service support, you’re company is doomed. Now let’s delve into Questrade’s customer service experience so I can give you my impression on their online and offline (i.e., telephone) efficacy. Most people will likely prefer to communicate with Questrade through online means. As such, you have a few options: Email, and Live Help real-time chat. Email response times were relatively quick. I sent four different emails regarding four distinctly different issues, and their reply times varied between one hour and eighteen hours. That’s pretty good. Their response content was very good as well. Nothing was canned, which is common when dealing with other companies over email. As for the online chat feature, while putting this review together I noticed that Questrade had repeatedly repositioned their live help’s green Chat button. I figure it’s probably because they are still finalizing on the best placement for it. But nonetheless, their chat button tends to be conveniently a fixed overlay on the bottom-right corner of most pages. It’s operational from Monday to Friday (excluding holidays) from 8:00am – 8:00pm ET. When clicked it brings up a pop-up window. After speaking with several online representatives — those who deal with potential new accounts and others who deal with existing accounts — I found them to be very well-informed, professional, and quick in their responses. They also took the extra time to provide external web links (those found outside the Questrade domain) for further reading which was a nice bonus. If the chat feature is unavailable (e.g., weekends, holidays, or outside service hours) you’re still able to leave a detailed message. When I tried this, I did receive a decent response when a representative returned. For customer support over the phone, they are available Monday to Friday, 7:30am – 8:00pm ET. For forex trading, they are open much longer, including Sundays. When I did phone in, I found that they support English, French, and Mandarin languages. Coincidentally, being trilingual I was able to speak to representatives in all three languages. Hold times varied based on what I was calling about. During midday on a workweek I found the wait time for a new customer to be about one minute. When calling in as an existing customer, the wait time was much shorter. This may be coincidental, but I also found that using their live help was much quicker than calling into their offices. Overall, speaking over the phone with their different departments was a very relaxing and helpful experience. They know their stuff! And not once did I feel they were rushing to get the conversation ended quickly. It felt like I actually mattered. My journey through the expansive financial world carved out by Questrade was a very enjoyable one. Although their list of achievements include free ETFs, very mature trading platforms, quality customer service, IPOs, and a comprehensive developer platform, their most impressive feature has to go to being able to execute trades as low as 1¢ per share (1¢ minimum for active traders; $4.95 minimum for non-active traders). It has been decades now and Questrade continues to carry the honour of being Canada’s lowest cost discount brokerage company. Questrade’s low commission rate is so good it serves as an enticer to make more trades more often and not have to hesitate by attempting to time the market in hopes of lowering commission costs. In MoneySense’s Canada’s Best Online Brokerages article, Questrade was top ranked as the best in terms of lowest fees and lowest commissions. They also received honourable mentions as the best in ease of use and overall independent broker. I can’t think of anything negative to point out about this company. It’s very clear they want to be in this industry and stay as the market leader in Canada. When speaking to several of their representatives online and over the phone you could feel a strong sense of pride in their written words and spoken tone. There is clearly a strong and positive ecosystem in their workplace environment. The staff seem exceptionally knowledgeable when assisting, providing a fulfilling experience. This is a far cry from my past dealings with other brokerages and banks. For most of my stock trading life I had been connected at the hip with my local bank. This was before I became more enlightened with better options that were out there. I’m sure this is the case for most people. Many of us usually get our first investment accounts at big banks (e.g., BMO InvestorLine, Scotia iTrade, RBC Direct Investing, TD Direct Investing) because of the ease to do so — we have our savings and chequing accounts with them already so it’s just logical to open a trading account there as well. Such conveniences, however, bring with it abuses by these banks onto their customers. And so it wasn’t until I became completely disillusioned by my bank’s high fees and endless shenanigans that I felt it was time to explore other financial outlets. And hence, here we are today and why I felt this in-depth Questrade review was a necessary obligation to write. Should you join? Yes — a resounding YES! For someone like me, as a casual trader, who has experienced headaches with banks and other brokerage firms, it’s nice to finally find a good home at Questrade who doesn’t play games, nor charge exorbitant fees. Questrade fits my needs perfectly and helps unlock my potential as a growing investor. Now I’d love to hear your opinion on Questrade. Leave a reply below, share this review, and rate them using the ratings gauge found at the very top of this page. This review has been updated many times over the years and, during such time, many questions have been asked by my readers in the comments section. For your convenience, I have compiled the most asked questions, with their corresponding answers, below. Stock shares cost 1¢ per share at $4.95 minimum ($9.95 maximum). ETF trade purchases are free. Questrade has no annuals fees and are the lowest cost stock broker in Canada. It’s also free to join with no catches. Lowest commission cost per equity trade in Canada. Questrade will cover the transfer-out fee when moving your brokerage account to them. Full-featured tools and trading platforms available on all devices. Very responsive customer service. Even when using live online help. Hold dual-currency (CAD and USD) simultaneously within registered accounts (e.g., RRSP) without automatic conversions, nor fees. To get $50 free from Questrade, simply type the following Offer Code: Canada into the Offer Code input box during the sign-up process. Get more information on this Questrade promo code and its promotional terms and conditions. Yes, you can! For those unfamiliar, dividend-paying foreign stocks will have a withholding tax levied on them by many (foreign) governments when held outside an RRSP account. Most of the popular foreign stocks held by Canadians are U.S.-based and thus, by default, have a 30 per cent withholding tax rate, but if you file a U.S. Internal Revenue Service Form W-8BEN through Questrade this rate is effectively lowered to 15 per cent. You can find this form under Account Management > Find Forms > Other Forms: W8BEN – For Overseas Residents. Several of you have been asking how to correctly fill out the W8BEN tax withholding rate lowering form. The only lines you need to fill in are: Line 1: Your full name, Line 2: Canada, Line 3: Your full address, Line 8: Your date of birth, Line 9: Canada, and at the bottom of the page: sign it, date it, and print your full name. That’s it! Now just use Upload Documents or mail this form directly to Questrade. Margin Power is a free service by Questrade that allows you to link your existing TFSA account (held at Questrade) to your margin account. Doing so increases your buying power within your margin account by leveraging the assets you already own inside your TFSA, making it enormously convenient to enter new positions without requiring a transfer of new cash or selling existing securities. If you have been a Questrade member before 2011, then you may have already discovered that their Trade Confirmations database, which claims to carry your trading details dating back to January 1st, 2009, in fact only rolls back to February 4th, 2011. Sadly, you may no longer have access to these older trading reports because Penson, Questrade’s old clearinghouse partner, who stockpiled these much older reports, has now shut its doors for good. When speaking with Questrade’s representatives, I got inconsistent answers on whether they still have these very old reports or not. Most people will sign up for the standard margin account, which gives you access to borrow funds at an amount more than your current cash balance. This extended buying power ability is very useful and can come in handy when you need to jump on market opportunities. Assuming you’ve bought on margin and haven’t settled your stocks after three days of the purchase, the margin interest rate can be as low as prime + 2.5%, which is in-line with most brokerages. ECN fees are fees enforced onto Questrade by an external network that charges you for making a transaction which removes liquidity from the market (i.e., buying at the ask or selling at the bid). Questrade doesn’t make any money from ECN fees; they simply pass this collected fee to the designated network to execute your order. Although these fees translate to mere pennies, one can avoid paying them altogether by executing transactions as a limit (or stop) order at the bid/ask instead of as a market order request. For U.S. stocks you can also send orders to non-direct access ECN networks (i.e., LAMP, MNGD, or POST) to avoid these fees completely. A dividend reinvestment plan (DRIP), which is also known as a direct purchase plan (DPP), allows you to reinvest your stock’s dividend income automatically into the purchase of additional shares of that security without paying any trading commissions. To register for a DRIP, log into your Questrade account, navigate to Account Management > Find Forms, and download & fill out the one page PDF file: Dividend Reinvestment Plan (DRIP) Authorization. You’d then use Upload Documents to send your signed form to Questrade. It takes up-to 24 hours to process your request. If you ever sell off your security entirely, your DRIP will be canceled. Yes, you can short stocks in margin accounts. Registered accounts (e.g., RRSP), however, cannot short because of Canadian government regulations. Yes, their trading platforms are available for Mac and Linux users. Questrade’s trading platforms are also available for Windows, iOS, and Android devices. For Linux users, Questrade Trading, their responsive HTML browser-based web application, is what’s used. To eliminate currency exchange fees almost entirely when converting CAD/USD, you will want to use Norbert’s Gambit. To do this, you will use tickers: DLR.TO and DLR.U.TO. The former deals in CAD currency, the latter in USD currency. Buy shares of DLR.TO (currency will be in CAD) in the amount that you want to convert into USD cash. Get ahold of a Questrade rep via live help chat or on the phone. Tell the rep that you want to journal over all of your newly acquired DLR.TO shares to its USD equivalent side (i.e., DLR.U.TO). Your shares will now shift from DLR.TO to DLR.U.TO and be in USD currency. Sell all of your DLR.U.TO shares. You will now have USD cash. Buy shares of DLR.U.TO (currency will be in USD) in the amount that you want to convert into CAD cash. Tell the rep that you want to journal over all of your newly acquired DLR.U.TO shares to its CAD equivalent side (i.e., DLR.TO). Your shares will now shift from DLR.U.TO to DLR.TO and be in CAD currency. Sell all of your DLR.TO shares. You will now have CAD cash. The entire process can take up to 1-2 business days to complete. The full details of your conversion is recorded under myQuestrade’s Account Activity page. Most people will fund their Questrade accounts through their bank’s bill payment method. However, some banks still impose an eight character limit. You can get around this problem by using just the first eight digits of your ten digit Questrade account #. Initially, shareholder communications (i.e., voting requests, annual meeting summaries, financial reports) are sent as paper mail to your physical address. For those who wish to save the environment by saving a few trees you can alternatively opt to receive these correspondence documents through electronic mail instead. A convenient free service called InvestorDelivery exists where you can set up to receive all of your investor correspondence electronically. InvestorDelivery requires a special ID that is stamped in the header region of each of your paper documents. So you’ll have to wait and receive a paper document of a security you own before you can switch over to its electronic alternative. Questrade will rebate mutual fund trailer fees. They call this their Mutual Fund Maximizer. Trailer fees are commissions by fund management companies paid to brokerage houses for being the retailer that sold you your fund(s). This commission is an ongoing source of revenue for brokerages as long as you keep holding onto those fund(s). You don’t see this fee because it’s part of the MER of the fund. So, Questrade is willing to rebate this fee back to you every quarter. But there’s a catch. You need a minimum of $36,000 in mutual fund holdings to be eligible for this rebate. The reasoning is simple: There is a processing fee of $29.95/month. So, the rebates will start paying back if your mutual fund holdings is worth more than $36,000 (based on a 1% trailer fee). 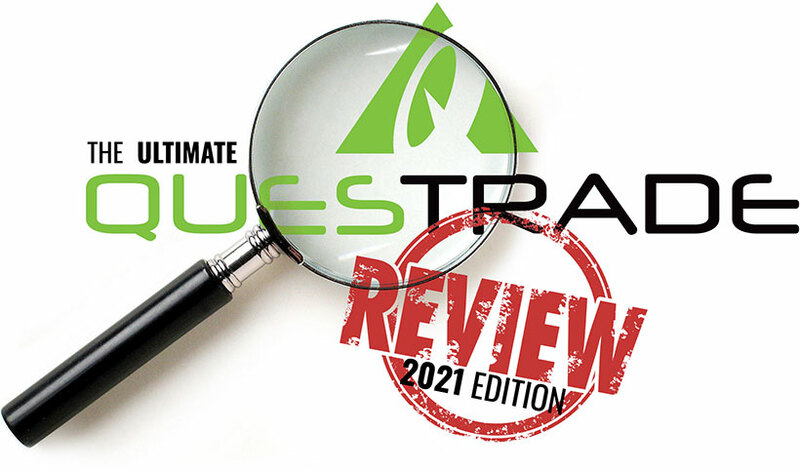 Because this Questrade review is determined to continue to be the most comprehensive and most up-to-date resource you will find anywhere, we’re listening to our readers once again and have created this section to compile the latest news and events regarding Questrade. Questrade has lowered their minimum funding requirement for their Managed Investment (Questwealth Portfolios) accounts from $2,000 to $1,000. For those who haven’t perused the Managed Investing section, this is a big deal because although you only need $1 to open this type of account, you need to reach the minimum threshold before they begin to actively manage your investments. It’s a good move. For individuals who are considering or are currently using Questrade’s freely available developer API, as of May 7, 2018, the IIROC Canadian requirements are tightening up with some changes. The most important change of note is that Questrade will effectively no longer be allowed to place an order entry by non-licensed individuals made through API requests. Fortunately, this does not affect order entries made by third-party applications (from licensed businesses) found in their App Hub. Deloitte has just announced that Questrade has been awarded with the designation of one of Canada’s Best Managed Companies. This is now Questrade’s seventh time earning this distinction in a row, putting them into the rare Platinum Club of companies. For those unfamiliar, Deloitte is one of the big four accounting firms in the world. They started the “Best Managed Companies” award 25 years ago to highlight the best Canadian businesses. For anyone holding an Exempt Market Product (EMP), starting on June 1, 2018, a fee will be assessed for the quarter in which you first acquired that EMP. Considering how most of you probably don’t even know what an EMP is, be assured that only a very tiny number of investors will be affected by this news. Unfortunately, at the time of this writing Questrade was unable to tell me definitively what the amount would be. On April 23 Questrade may begin to charge you for holding selected securities short in your account. If you are currently short-selling, they advise logging into your trading platform, head over to Positions, and hover over the R icon to see the fee. If you don’t want to pay this fee then you need to cover your short positions by 5:30 EDT on Monday, April 23. IQ Edge and Questrade Trading have been updated to improve the automated short-selling process. You no longer need to manually confirm borrow rates. And confirmations can now be done within the trading platform. Prior to entering a short position, you’ll receive an on-screen message showing the cost per day to borrow a security, if applicable, alongside your order confirmation. Once you accept, your order is sent to the exchange and your short position will be charged for each full day you hold it. Note: There is no fee for Intraday shorting if you close your short positions before 5:30pm ET. Questrade did a major redesign overhaul of their homepage. The new design has a more efficient streamlined look, which better exposes important resources upfront. For example, communication resources like chat is now found on every page, as an overlay, at the bottom-right corner. This new design is also more responsive than the previous and thus, works more fluidly across different devices like phones and tablets. Canada Post has begun a series of rotating strikes in different cities across Canada. Since Questrade is primarily an online brokerage, they are not affected by it. That being said, however, there are some scenarios that might affect you during this strike, such as sending documents by mail: use a courier, e.g., Fedex/UPS, instead, sending/receiving payments: refrain from using cheques at this time, brokerage account transfers: processing delays are expected, and delays in the delivery of shareholder communications. Questrade has an online webinar coming up on October 26 @ 2:00 pm ET, hosted by VectorVest. It’s free for the general public to register for this event. They’ll discuss quick steps for better trading consistency, simple techniques to reduce stress when making trading decisions, and an in-depth look into stock buying to help target and narrow-in on stocks of interest. Questrade has rebranded and relaunched its popular managed investing division, formerly known as Portfolio IQ. It is now known as Questwealth Portfolios. They have cut fees sharply, which now makes them the lowest cost robo-advisor service in Canada (0.20%); resulting in their managed MER% coming in lower than what Vanguard Canada charges for its popular ETFs (0.22%). Waterstone Human Capital has named Questrade as Canada’s Most Admired Corporate Culture for 2018, due to their performance and competitive nature. This is a nationally recognized annual award for the best-in-class Canadian organizations across six categories. From now to March 31, 2019, when transferring an account to Questrade, they’ll rebate your transfer fees up to $150 per account. There is no account limit nor any minimum transfer amount. Security Enhancements: Customers must now change their passwords once every 6 months, assuming you are not already using two-step verification. Mobile users can now enable Biometric logins through Settings within their trading app. And lastly, logins from new devices, locations, or operating systems will generate an automatic email alert. Props to you folks for putting together a hefty sized questrade review. I remember when questrade required you to have an initial deposit of $10,000. Yes, that is ten-thousand. I guess they really embraced the idea of going for the smaller ma-and-pa investors by reducing it to $1,000 which i think is smart. That was the big reason i didn’t join back then with questrade. This was back in 2005 or so. Looks like they really improved things. That’s nice to read that questrade keeps records for several years. With all businesses going electronic exclusively it is just much easier to have them keep it on their servers as long as possible. With my credit union they had limited trading but i was happy…the only thing that was annoying was they would only keep records for that month which was annoying, and they didnt offer paper records. I’m about 1/3 of the way through this questrade review and i think i am satisfied. We are looking for a place to park our money in an RRSP account. We’ve been advised to make use of our contribution space since we never have and so the best course is probably to open a trading registered account. I think what won us over is that you can hold both canadian and us dollars in the same registered account. TD, my bank, doesnt do that which is why we were thinking to look around. I think we will discuss things a bit more and come back to this review a few more times but just wanted to say my thanks for making it easier for us. So i am guessing the questrade promo code of $50 will work for us evne if it is a registered account? Why do all places go with the dark theme for their trading platforms? I for one prefer a more brighter trading window so i can see everything. I guess to each his own. Is there a way to customize the windows to be brighter or is that the only look? My computer isn’t at a high resolution and so the screenshots in this questrade review appear really small. I didn’t realize that it was scaling relative to my screen after tapping to view the larger images. I wanted to see more (full size of the image) and thankfully all i did was right-click and select "View Image" to see the full size. Just thought i should share for anyone else who was looking for bigger sizes for the images. Since questrade is on a mission to revamp everything they should look to adding more social tools. I’d like to chat with friends and look to real-time advice while inside questrade iq, or inside questrade accounts. Can one go crazy and create like 10 questrade accounts, one for each family member, and have them connected in a way so that family members can transfer funds between accounts? This would be handy for my growing family where i want my children to have trading accounts of their own but connected to mine so i can monitor their activity and move funds into their accounts when need be. Nice to see Questrade has really improved. I remember way back in the day (circa 2000) when i was starting to trade i was thinking of joining Questrade but was turned off by their lack of everything. It’s good to see them really cleaning up their act and becoming a superior trading environment. I am happy with my broker right now but i am glad i came across this questrade review so if things change i might give them a second look. I just shared this on my facebook page. Cheers. You weren’t kidding about them being $4.95 per trade being the lowest in Canada. After reading this questrade review i decided to look around for the past week for anyone else. I couldn’t find a single person that had a deal that compared. And if i did (i think i saw one @ $6.95) there was always a catch (you had to make at least 100 trades per month to qualify for $6.95/trade — huh?). So i guess i will join questrade and get this over with. Thanks for the questrade offer code. Hmm, i am still trying to decide if i should open a questrade business account seeing as how there might be some taxing benefits to it like how there is for health plans (phsp). I’ll bookmark this review and come back for later analysis. Thanks for existing. I am always, always outside and on my phone so questrade app is what i am really interested in. I hope you guys will write another awesome questrade review about it. Haven’t read much into it but is there an HTML5 alternative on iPhone or is it exclusively a stand-alone app for iPhone only? For the most part @Miranda its just a cool sounding term. Let’s face it Questrade IQ sounds much better than QuestraderWeb. I personally like the name for a trading platform. Makes me sound like i am smart even if i am a horrible trader. as far as i know @cr@wd you can use the questrade offer code on as many accounts as you like regardless of being a prior member with them. To be on the safe side you can always use their chat online at questrade’s website and ask. Ya ok so this might sound dumb but the "iq" part mentioned in this review regarding questrade iq, what does it mean exactly? Or is it just a marketing ploy by questrade as something new?